as we wait for the consoling presence of the heavenly Physician. Advent is about waiting, but in this waiting there is nothing passive, nothing of the quietism that would have one sit like an inert lump without passion, energy, or desire. Advent has been called the Lent of Winter, and with good reason. 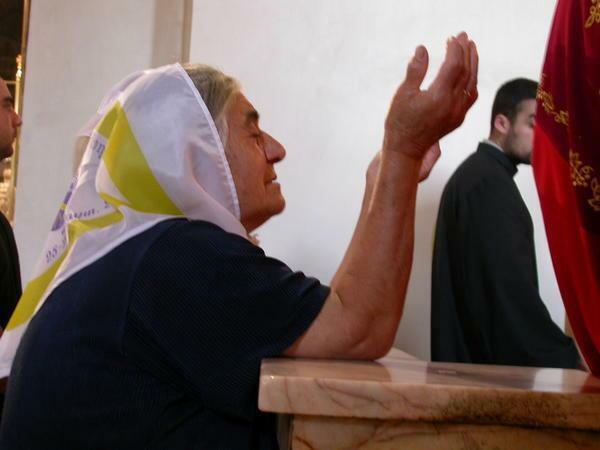 The very qualities that characterize the Lent of Spring, should characterize Advent. 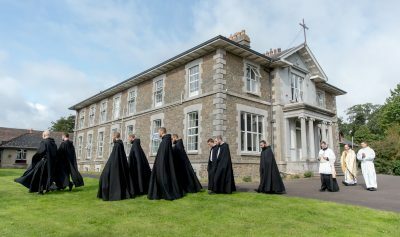 Does not Saint Benedict say that “a monk’s life ought at all times to bear a Lenten character” (RB 49:1)? 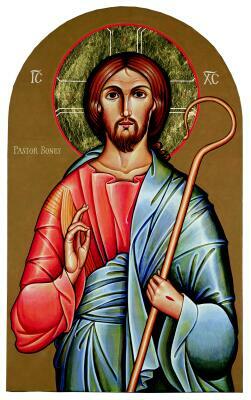 What is the essence of this Lenten character? Saint Benedict, after inviting us to a spontaneous generosity in prayer, in self-denial, and in silence, sums it all up by saying, “and so with the joy of spiritual desire, look forward to holy Pascha” (RB 49:7). The “joy of spiritual desire” is the key to “preparing the way of the Lord” (Is 40:3). I made a day trip into New York City today. Thanks to Deacon Richard Russo, Father Jacob Restrick, O.P. 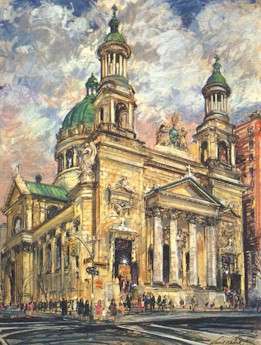 and I were able to visit the magnificent Church of Saint Jean–Baptiste on Lexington Avenue at 76th Street. The Church, completed in 1913, is served by the Blessed Sacrament Fathers, sons of Saint Peter Julian Eymard. I have long nourished a special devotion to Saint Peter Julian Eymard, an impassioned lover of the Most Holy Eucharist. Today’s visit to Saint Jean–Baptiste Church was, in some way, a pilgrimage to Saint Peter Julian. I have wanted for some time to write again about the grace of the prayer of repetition. Today a God–seeking soul shared with me that she used to think of the prayer of repetition as second rate. Her ideal was to remain perfectly still, empty, and receptive before God. Unable to do attain her ideal, she fell to the humble prayer of repetition, and now has come to recognize its value. She often prays the Chaplet of the Eucharistic Face of Christ. Like others, she has found that this humble prayer of seeking, desire, supplication, and praise anchors her in the presence of Our Lord. The repetition of its invocations (like the prayers of the Rosary) binds her gently, but effectively, to God. 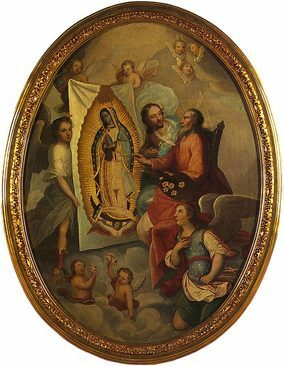 I n this 17th century Mexican painting, the Virgin of Guadalupe intercedes for the soul depicted under the form of little child. Saved by the intercession of the Blessed Virgin Mary and helped by her guardian angel, the soul escapes the clutches of Satan, and flies directly to the wound in the side of Jesus. There she is embraced by Jesus who detaches one arm from the cross to draw her to Himself. 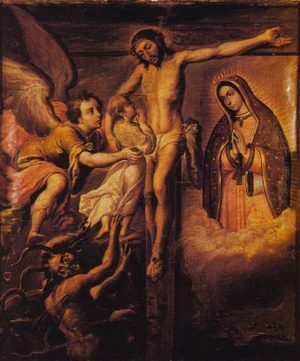 To Satan’s rage, the soul is purified in the Blood and Water that flow from the Heart of the Crucified. and on her head a crown of twelve stars (Apocalypse 12:1). I shall not cease to be (Ecclus 24:14). How I love this sixeenth century Mexican depiction of the Eternal Father painting the image of the Virgin of Guadalupe, the Immaculate Conception! The Eternal Father is deep in conversation with His Son; between them flutters the Holy Spirit, the living bond and perfection of their love. Note the way the artist sought to show he wings of the dove in movement. The Eternal Father Himself, the Divine Artist, is holding His palette; the palette bears the roses that He is applying to the Virgin’s robe. 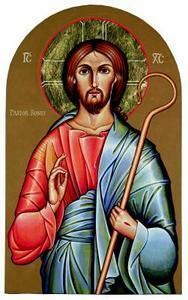 The gaze of the Son, with an ineffable tenderness, is fixed on the Face of the Father. “I was with Him forming all things: and was delighted every day, playing before Him at all times” (Pr 8:30).